Wharram Percy a medieval village situated in the beautiful Wolds of the Ryedale District of North Yorkshire is well worth a visit. This village sits in the bottom of the valley and cannot be seen from the road and the scenery is wonderful. Wharram Percy as a village evolved sometime between the 10th and 12th centuries. It flourished between the 12th and 14th centuries and was hit by the black death of 1348-9. The villages decline came about towards the end of the 15th century when the landlord decided to convert Wharram Percy into sheep pastures and many of the inhabitants moved away. The last four families were evicted between 1488 and 1506. The site houses standing 18th century farm cottages and the ruins of St Martin’s Church. Nearly 700 medieval skeletons have been excavated on this site. These have been studied by scientists and DNA tests showed signs of tuberculosis. Also found was an 11th century male skull which had taken a heavy blow with a blunt instrument, this wound was treated by the cutting away of bone to relieve the pressure on the brain and evidence shows the patient lived for many years. 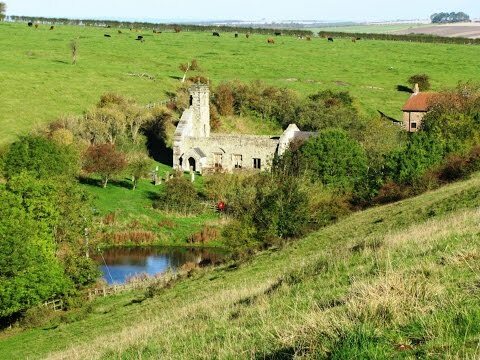 In the 13th century Wharram Percy had two water mills, a fish pond, medieval houses and farmsteads. The rest of the history you can find out for yourself in this old medieval village of Wharram Percy. We park in the free car park. If you only wish to visit the deserted medieval village take the path at the end of the car park and walk down hill, through the gate, down the steps, cross over the dismantled railway line and then head straight forward. We turn right out of the car park and walk on the road, which is part of the Centenary Way, until we come to a right hand bend. The walk goes through the gate opposite, but we take a detour staying on the road going left round the bend heading downhill, now part of the Chalkland Way, to take a look at Fairy Dale and a disused quarry. We retrace our steps back up the hill to the gate. We go through the gate and follow the Centenary Way, passing a footpath on the left, until we come to Deepdale. Here we go through the gate and turn right and follow the edge of the Dale. Soon Wharram Percy and St. Martins Church come into view. At the sign post turn left downhill to a gate and into the site of the deserted medieval village. We take time to have a good look round and also take a break. At the other end of the medieval village we follow the track to a gate and the dismantled railway line. Here you can go over the railway line, up the steps, through the gate and then follow the path uphill to the car park or you can do as we did and turn left onto the railway line and walk straight ahead past the station house then take the tarmac road uphill behind the houses. We take a look at the disused quarry on the right and then carry on up the road to the Wharram-le-Street village sign. We take the footpath on the right going through the hedge, still on the Centenary Way, and walk straight ahead along the edge of the field until we come to the road. Here we turn right along the road and the car park is on the right just past the farm. This is a moderate to hard walk with some steep inclines and declines. The full walk is approx 4.25 miles using OS map 300. With the detour add 1 mile. From the car park to the medieval village return is approx 1.5 miles. Take the A64 York to Scarborough then take the B1248 through Malton and Norton towards Wetwang/Driffield. Staying on the B1248 go through North Grimston to Wharram-le-Street. Take the first right after Wharram-le-Street and follow the road until you come to the car park on the right just past the farm. There are no public toilets. For refreshments there are shops and pubs in Malton and there is the butcher “Meat Your Needs” and the Middleton Arms at North Grimston.